I have just received from the Government of Cundinamarca a book that deals with on the shields and flags of this department. This book is called "Shields, Flags and Hymns of Cundinamarca", written by Rosalba Salazar Gallo for the Secretariat of Culture of Cundinamarca. 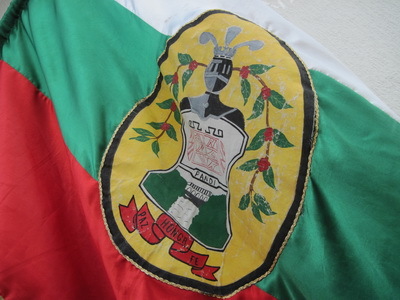 Here is the flag of Pandi (Sumapaz Province). Blanco: representa la paz y armonía que siempre ha caracterizado al municipio. El color verde: simboliza la fe y esperanza que llevan los pandinenses, por vivir cada día en armonía. El rojo: Significa el amor por el pueblo y la patria." 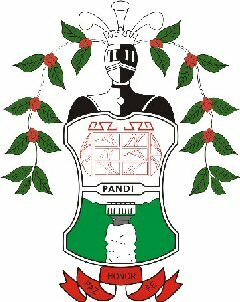 The official website of Pandi displays its official flag being the one featured on FOTW charged with the coat of arms as seen here.